Astronomers looking back to a time soon after the big bang have discovered swirling gas in some of the earliest galaxies to have formed in the universe. These newborn galaxies, observed as they appeared nearly 13 billion years ago, spin like a whirlpool, similar to our own Milky Way galaxy. Garth Illingworth, professor emeritus of astronomy and astrophysics at UC Santa Cruz and a member of the international team that made the discovery, explained that light from distant objects takes time to reach Earth, so observing objects that are billions of light years away enables astronomers to look back in time and directly observe the formation of the earliest galaxies. 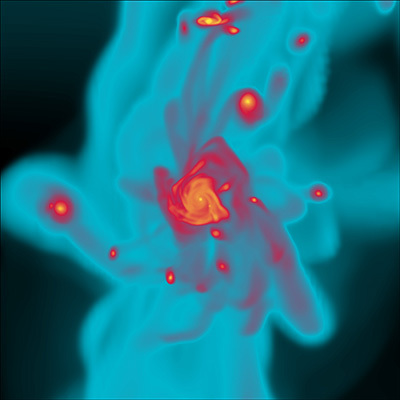 Using the Atacama Large Millimeter/submillimeter Array (ALMA) in Chile, the team led by Renske Smit at the Kavli Institute of Cosmology, University of Cambridge, identified star-forming galaxies at a very early stage in cosmic history that spin in a way thought not to occur until much later times. 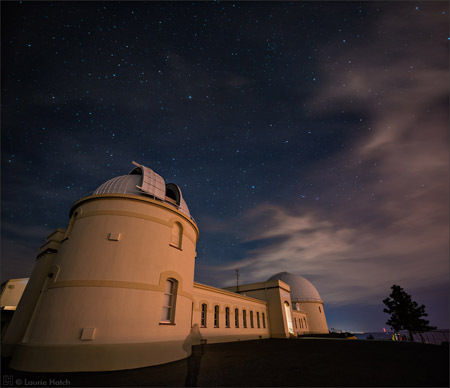 The results are reported in the journal Nature and will be presented January 10 at the 231st meeting of the American Astronomical Society in Washington, D.C.
“ALMA opens up a new window in the spectrum that allows us to measure motions in these early galaxies in a way that has been impossible to date, even with telescopes as powerful as Hubble. This provides new insights into the dramatic activity in these young galaxies as the gas is being transformed into stars,” Illingworth said. 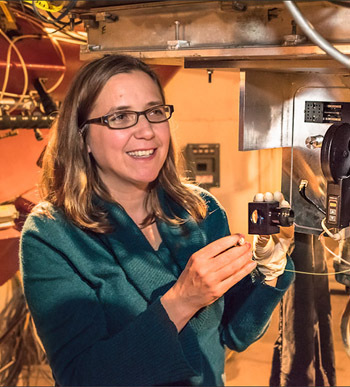 Smit and her colleagues used ALMA to observe two small newborn galaxies as they existed just 800 million years after the big bang, which was 13.7 billion years ago. By analyzing the spectral ‘fingerprint’ of the far-infrared light collected by ALMA, the researchers were able to establish the distance to the galaxies and, for the first time, see the internal motion of the gas that fuelled their growth. 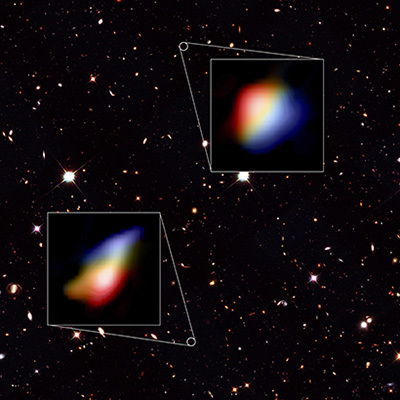 “This is a remarkable discovery given that the team used ALMA to look back through 94 percent of all time to capture the faint signals from these two galaxies,” Illingworth said. “Until ALMA, we’ve never been able to see the formation of galaxies in such detail, and we’ve never been able to measure the movement of gas in galaxies so early in the universe’s history,” said coauthor Stefano Carniani at Cambridge’s Cavendish Laboratory and Kavli Institute of Cosmology. 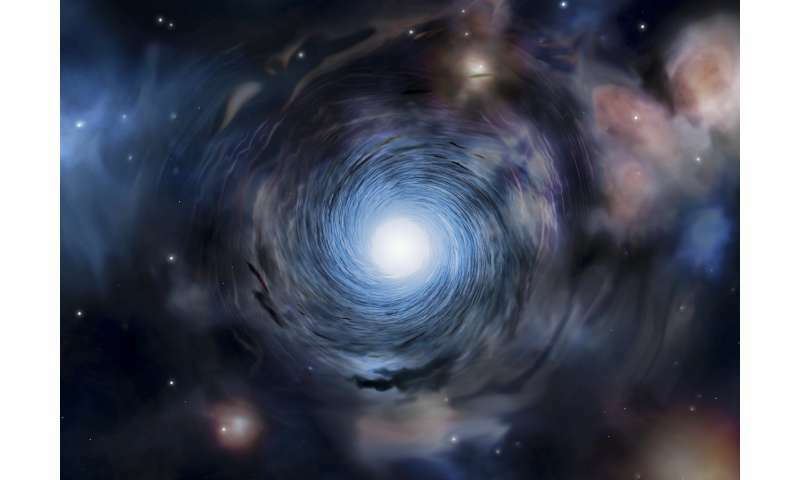 The researchers found that the gas in these newborn galaxies swirled and rotated in a whirlpool motion, similar to our own spiral galaxy and other mature galaxies much later in the universe’s history. Despite their relatively small size—about five times smaller than the Milky Way—these galaxies were forming stars at a higher rate than other young galaxies. But the researchers were surprised to discover that the galaxies were not as chaotic as expected. “In the early Universe, gravity caused gas to flow rapidly into the galaxies, stirring them up and forming lots of new stars. Violent supernova explosions from these stars also makes the gas even more turbulent,” said Smit, who is a Rubicon Fellow at Cambridge sponsored by the Netherlands Organization for Scientific Research. “We expected that young galaxies would be dynamically ‘messy’ due to the havoc caused by exploding young stars, but these mini-galaxies show the ability to retain order and appear well regulated. They are already rapidly growing to become one of the ‘adult’ galaxies like we live in today,” she said. The results from this project pave the way for larger studies of newly-forming galaxies during the first billion years of cosmic time with ALMA’s uniquely powerful capabilities and with the upcoming James Webb Space Telescope. The research was funded in part by the European Research Council and the UK Science and Technology Facilities Council (STFC).